By now you've likely heard the shocking news about Coats pulling the plug on Free Spirit / Westminster. As a fabric lover, my morning was derailed when I heard the news. I was texting everyone all my fabric friends piecing together the story and trying to get answers. After watching Tula Pink's livestream today, it sadly looks like she was just as blindsided as the rest of us. I also picked up on something else from watching the comments from other viewers: ...a lot of consumers don't really understand what the scope of a fabric designer is. I field a lot of questions from fellow fabric lovers through Instagram, email, etc. that I don't always have the answers to. Sometimes I get annoyed because I'm thinking, "Why do they expect me to know this?" Then I remember that most people don't know what the don't know. And what they don't know is the boring, unsexy behind the scene details of being a fabric designer. So think of this like an a FAQ that is completely useless! These are all questions that fabric designers (i.e., me) are frequently asked, but probably won't be able to answer. Where can I buy your fabric? When will your fabric be available in stores? Is X shop going to carry your fabric? Is X collection still in print/available for wholesale? Will there be precuts available of your fabric? I live in X country. Is you fabric sold here? As a fabric designer, I license my work to my manufacturer. That means I provide them with artwork, and they handle the rest. They pay me a royalty to use the artwork on fabric that they can then sell. They do not print it "for" me. I don't work for them and they do not work for me. We're two independent business with our own duties. My duty is to make the artwork...and that's about it. Anything else I do is pretty much a bonus. 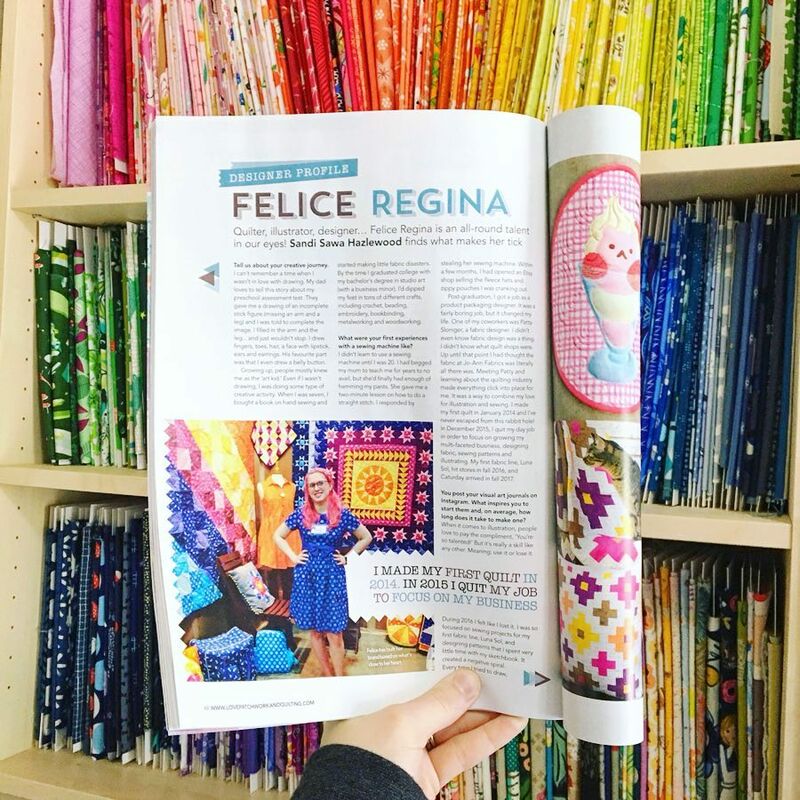 I design patterns, sew projects, photograph my look book, and attend Quilt Market because I want to, but I am not required to do any of that. My manufacturer's duty is literally everything else. They work with the mill to print the fabric. They coordinate production, manage the warehouse, take wholesale orders, ship the fabric to stores, etc. I don't have a hand in that. So you know when you ask the teenage employee at the movie theater why a large popcorn is $15 and they shrug and say, "I dunno, man. I just work here." Well, I'd say the same except I DON'T EVEN WORK HERE. That would be like asking the director of a movie that's being shown at the theater why the large popcorn is $15. So when you ask a fabric designer a question about anything other than their artwork and they say, "I don,'t know," it's not because they're clueless. It's because it's probably a question for our manufacturers! 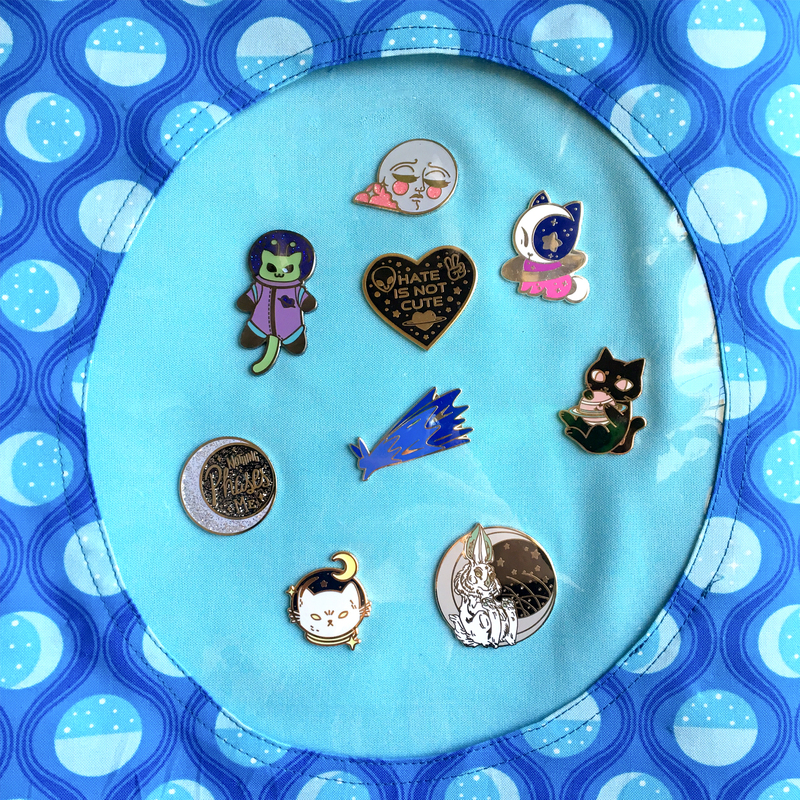 Since I started designing and selling enamel pins last year, my pin collection has exploded! I’ve gone from a few pins on my denim jacket to nearly covering a large pin board. As my collection has grown, I’ve gotten more protective of it. I’m fearful of wearing them out in public and losing or damaging them. 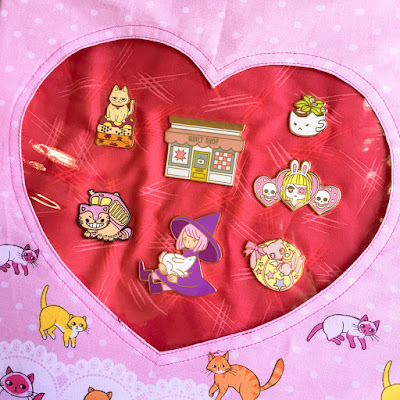 I discovered ita bags through Instagram recently. Ita bags generally refer to bags that are decorated with fan merchandise, but the term seems to frequently be attached to bags that have a clear vinyl layer to protect said merchandise from being lost or damaged. The most popular ones seem l to be girly pastel backpacks, but I wanted something super simple. The Heart Eyes Ita Tote is nothing if not simple. I knew the pins would add weight to the bag so I didn't want to fuss with any interfacing, hardware, or zippers that would further weigh it down. 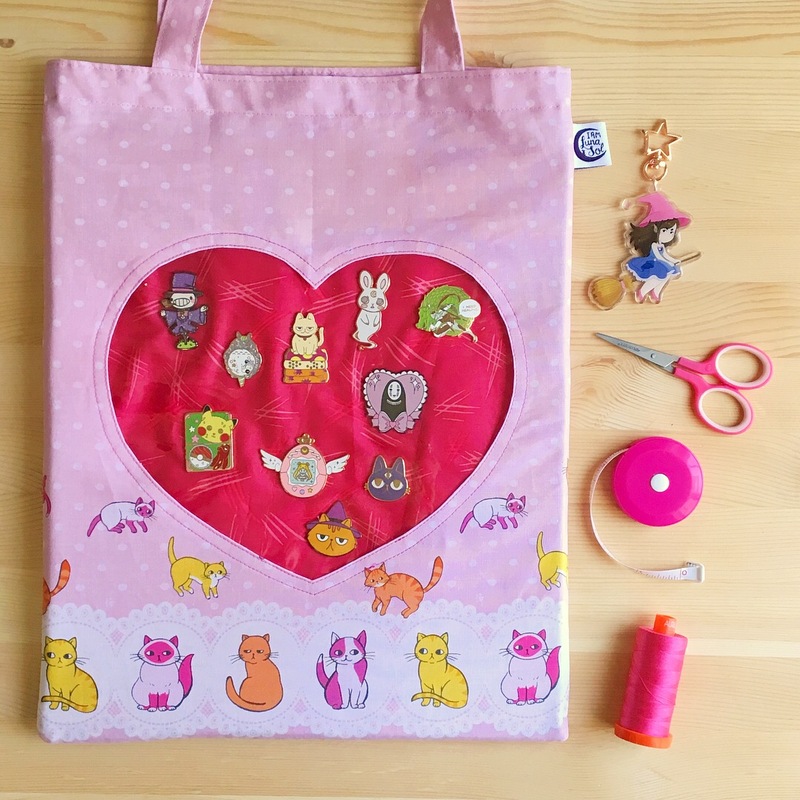 The unlined 12" x 15" tote has a clear vinyl window and simple "pocket" for you to mount your pins on without risking losing or scratching them. The pocket is made with a layer of thin foam to ensure the bag keeps its shape and doesn't bow out from the weight of the pins, all while being a very lightweight bag. 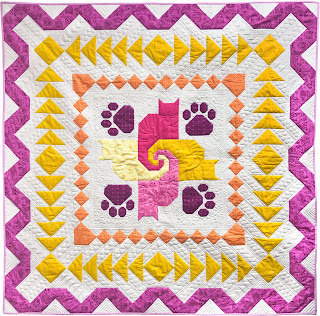 The pattern includes three window shapes: a heart, cat, and oval. The instructions walk you through the process of preparing your vinyl, but don't worry, there's nothing difficult about sewing with this material. The only things you have to keep in mind with vinyl are that 1) holes are permanent and 2) sometimes the material can "stick" to the bed of your machine due to the texture. I usually use my left hand to hold the excess vinyl that's not under the presser foot to keep things moving along. 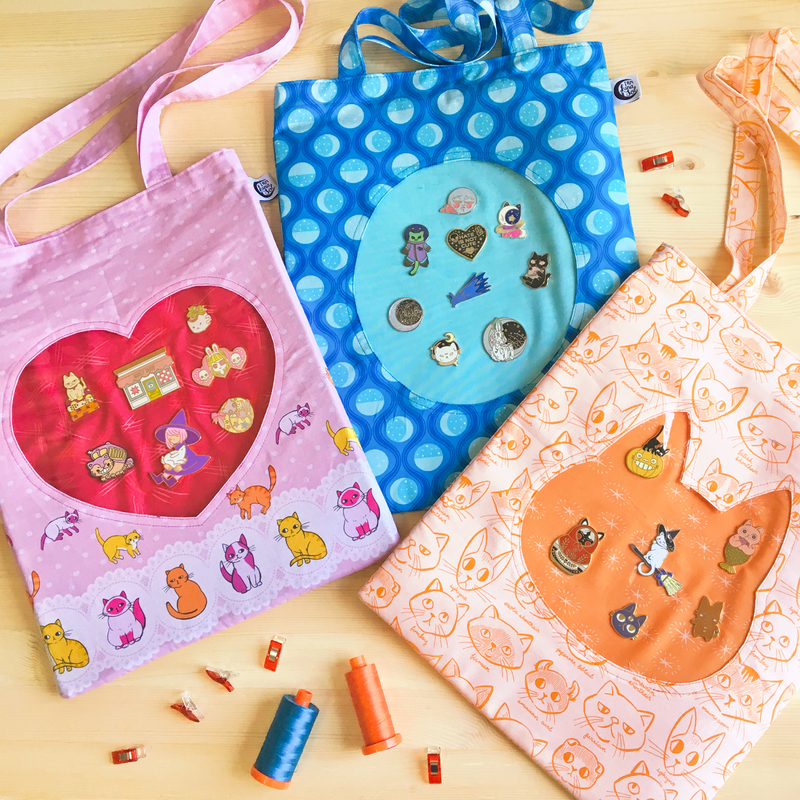 These bags are quick to make. You can go from uncut supplies to finished tote in under 2 hours easily. 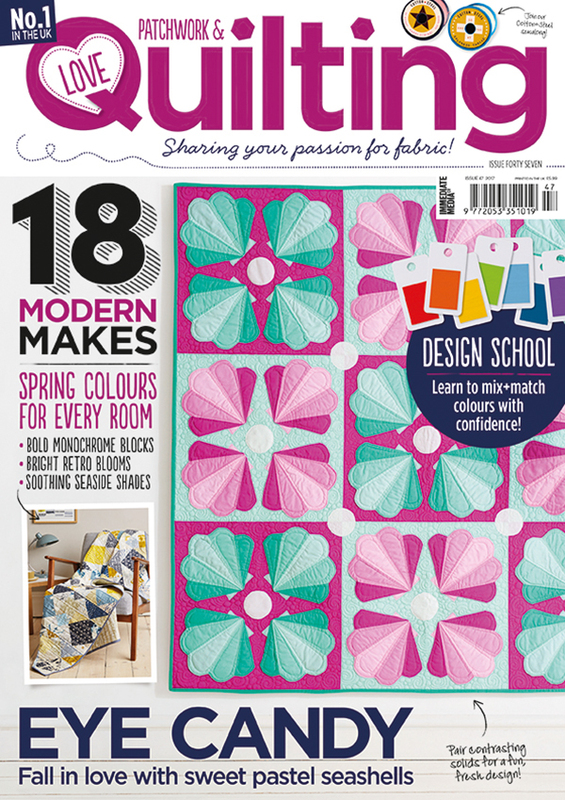 You can use quilting cotton or lightweight canvas too. The pattern is available for $5 on my Craftsy Shop or $5.40 on my Etsy (price difference covers the Etsy fees). 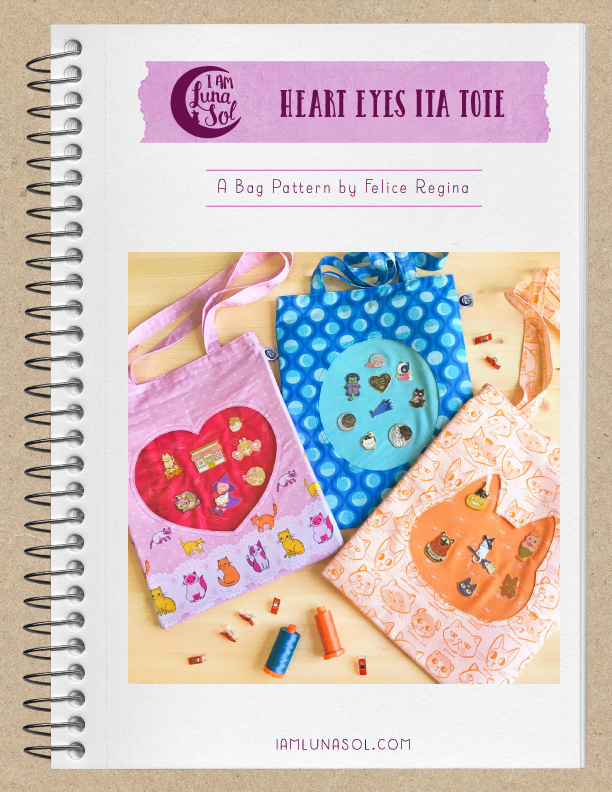 Share your projects on Instagram with the hashtags #HeartEyesItaTote and #iAmLunaSolPattern! 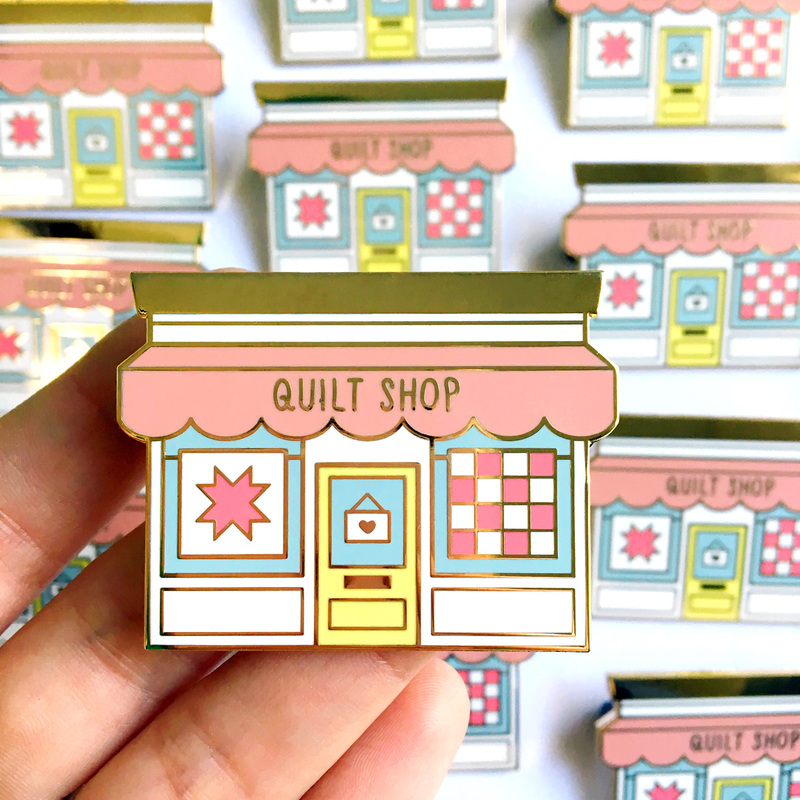 Don't forget to check out my enamel pins on Etsy as well as my current Kickstarter for my first collection of fanart pins. 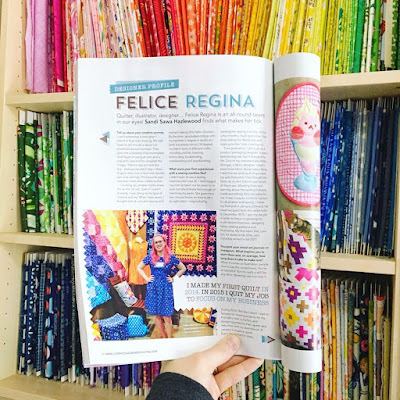 I made my fabric design debut in 2016, but 2017 was the year things really started to kick in and feel real. Lots of changes, lots of projects (sewing and non-sewing), and never enough time/energy to do it all! I keep a running list of all quilts I make (excluding mini quilts). I only count them when they are 100% complete, as in bound, and snuggle ready. Quilt tops don't count. 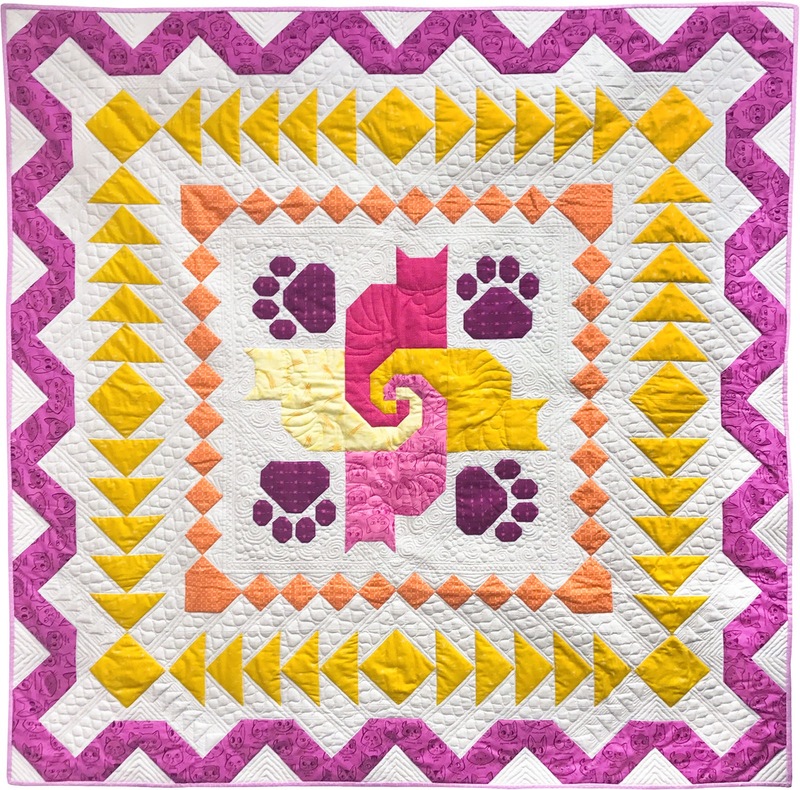 I made 16 quilts during 2014, my first year as a quilter. 2015 saw 19 quilts, and in 2016 I made a crazy 25. In 2017, I only made 18. Just kidding, that's still a lot! All but three quilts (#6, #7, and #8) were my own pattern designs as well. 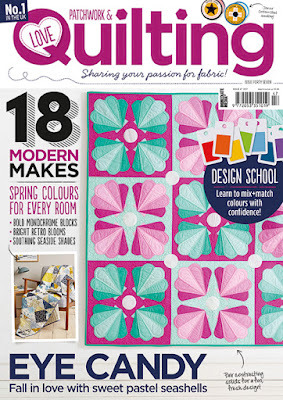 I also had a several publications in Love Patchwork & Quilting magazine, including 2 full covers and 1 smaller cover image. 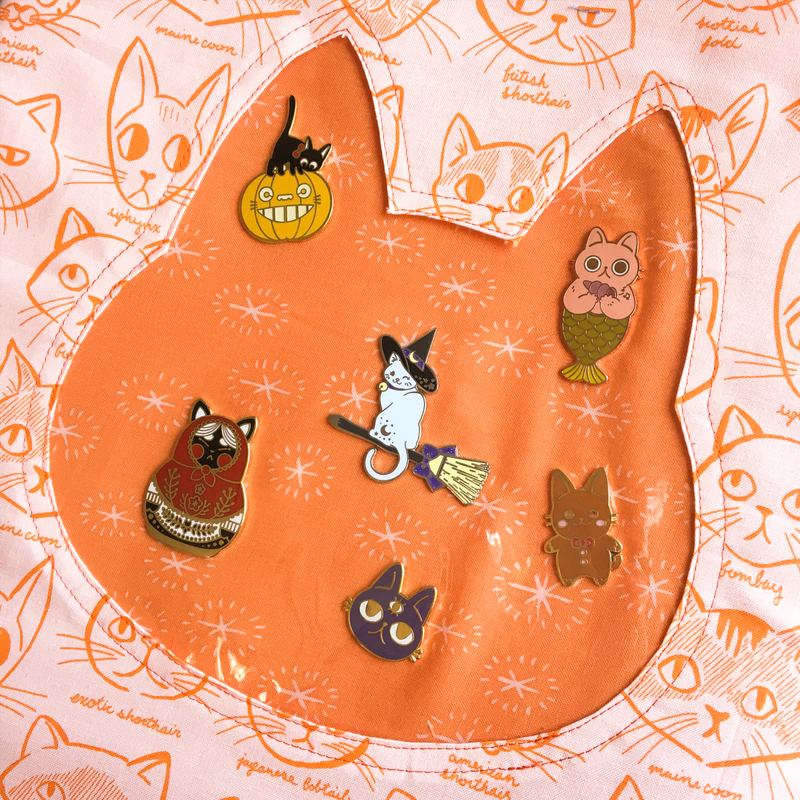 My second fabric collection, Caturday, showed at spring Quilt Market in St. Louis and hit stores in October. 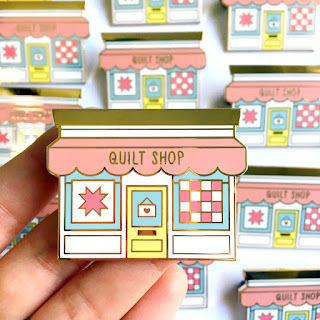 Non-quilt things: I released a total of 16 enamel pins! Pins have been a big source of joy to me this past year, as I love supporting and collecting the work of other independent artists. They've also proved to be a fruitful part of my business. In addition to pins, I also stocked up my reopened Etsy shop with original stickers and art prints. 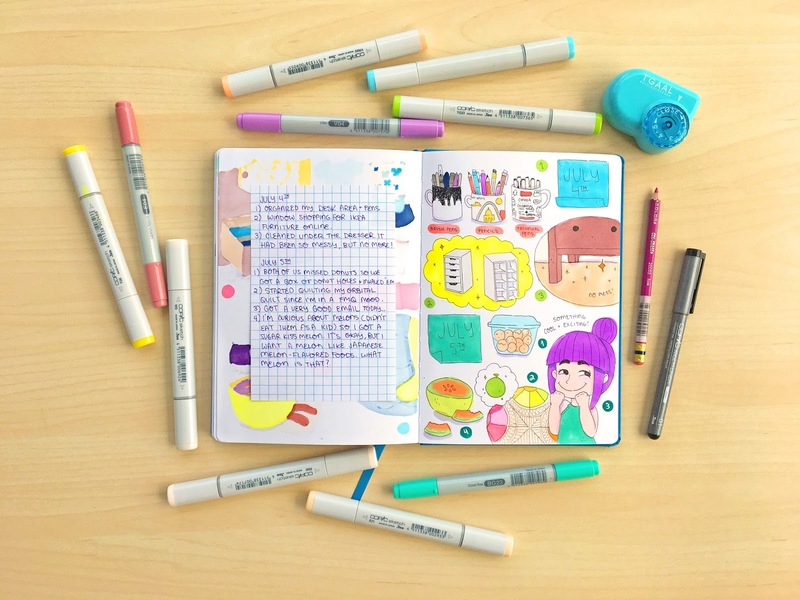 I did nearly a full year's worth of visual journal entries in an effort to force myself to draw every single day. And certainly not least, we moved from Houston to Bryan, Tx. in September! After 3 years of living with my parents, Seth and I were deliriously happy to find our own place. All in all, wrapping up 2017 was probably the first time I've been able to look back at the year and see that I can do this. I can support myself by doing the things I love. I hope 2018 brings more of the same!